a.k.a. The Day After Moving Day! 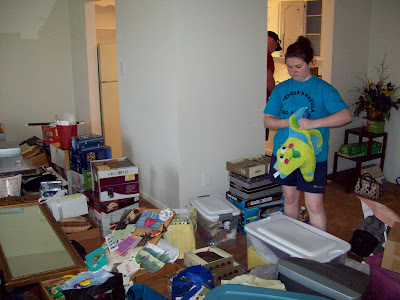 Sunday and yesterday were moving days for our older daughter Amy and her h... hus... husband. Husband. There, I said it. Her husband Mark. 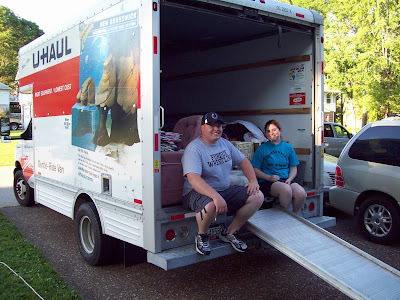 So, Lady Suzanne and I packed up a U-Haul and three vehicles and moved the new bride and groom to their first apartment just south of Indianapolis. As we were packing and unpacking wedding gifts, I noticed several wall decorations and other items with one of Amy's favorite sayings. 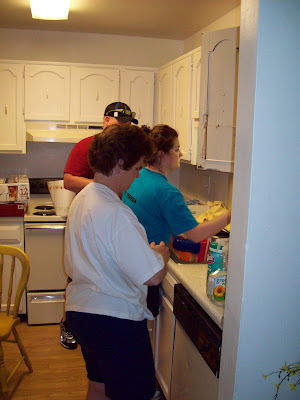 Awww,,the old "3hrs away" routine...:) far enuff to stop the Outlaws...sorry, i meant the Inlaws from keeping popping in....close enuff for a day visit every now and then, or if you need them to mend stuff or lend money. he has learned the lesson of washing glittery clothes with everything else...this recent college boy with only brothers will learn a lot more valuable lessons in the weeks to come! not anything you'd covet, Sir D, unless you want my old cheerleading uniform or girls' dance costumes, or a grass skirt from Hawaii or any of the great things that have been tucked into closets and forgotten about, until now! we do not live simply here -yet! Yeah, 3 hours is perfect! Lady Meagan moves to St. Louis in September and Sir Ryan is moving to Indianapolis in two weeks! I'm not sure who's more excited...me and Lady Allwinky or the kids?! LOL! It's all good, and necessary.